Exodus 24:15-18 Then Moses went up into the mountain, and a cloud covered the mountain. The glory of the LORD abode on Mount Sinai, and the cloud covered it six days; and on the seventh day He call to Moses out of the midst of the cloud. The sight of the glory of the LORD was like a consuming fire on the top of the mountain in the eyes of the children of Israel. And Moses went into the midst of the cloud as he went up into the mountain; and Moses was on the mountain forty days and forty nights. Patience is one of those things… so hard to learn it… so hard to practice it faithfully in our daily walk. It’s one of of those things I truly wish we didn’t have to learn -- but God requires it of us! 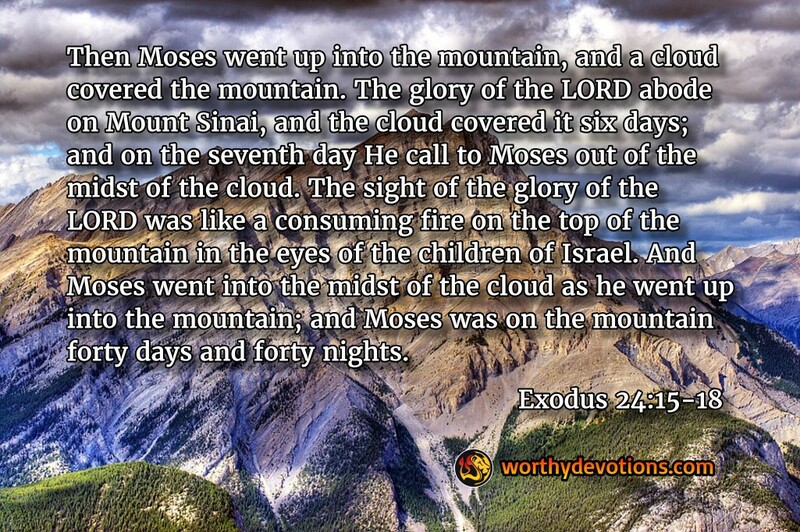 As I was reading through this passage again in Exodus, it dawned on me that Moses sat on the mountain for six entire days before the Lord spoke to him. He had to patiently wait for the Lord for six days! So often we think we can just do as we please with our lives and then come running to God for a few minutes of prayer and get an answer right away but I don’t believe it is always that simple. Even Moses needed to be prepared for six full days in order to be able experience the awesome presence of the Lord! If Moses had to wait six days – then it should not surprise us if we need to wait 60 days, 60 months or even 60 years for the Lord to prepare us to receive His blessing! Hmmm… perhaps the Lord is saying to us today -- Be patient my child, if you wait on me I will give you a treat! Be encouraged! The Lord is preparing us for great things. Spend more time seeking Him and worshipping Him. Keep waiting at His feet. He will meet us! There's so much work to be done. Turn Rock into Living Water! Know You're Led and Protected! It happened to the best of them!